This week I would like to write about spontaneity. Homeschooling is a beautiful thing, because it allows for spontaneity. We are commanded to teach our children when they rise up, when they lie down, when they walk in the way. Torah is what we are to teach, but as I have been learning, Torah touches all the corners of our lives. So here are some spontaneous moments from our week. The kids pretended to be birds out in the hayfield. They built nests out of twigs, and flew around the field. I got to watch some very large bluebirds, chickadees, crows, and chickens. The kids asked me to put some music on for them to dance. When Gramma came down for breakfast, Elisha (2) went to her and started pulling her hand. “Dance, dance,” he mumbled. 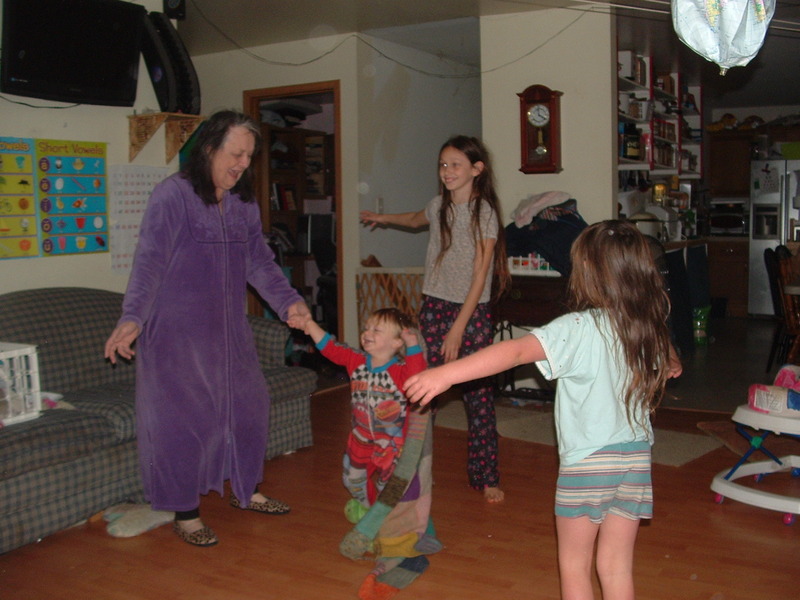 He led Gramma out on the dance floor and spun with her. Sweet, and so gentlemanly. Isaac asked us to rearrange his room. (Much needed, by the way) So Doug and I pulled out the extra bunk bed and I reorganized his stuff. 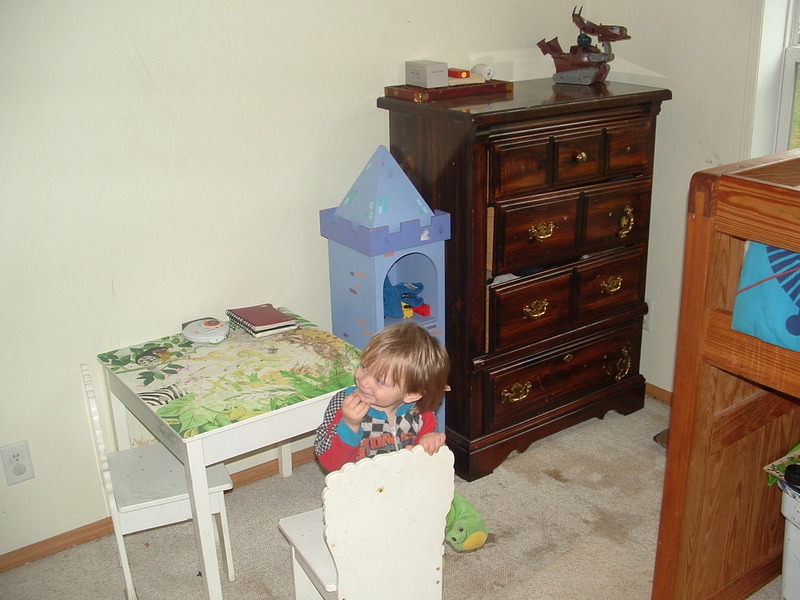 I took pictures of his room neat, so he could match it when tidying up. We set up a play area for the kids in the basement. It is set up like the rooms in a house so they can put things away easier. Naomi picked out a nature reader to continue her reading practice. The kids used the computer to play math games. It was a nice little break for them, and I was pleased to see how well they are doing. We started reading a “long” book before bed. It’s about a boy who is scared of everything. Looking ahead, it seems that a trip to the library will soon cure him of that. By the way, reading out loud used to be my nemesis. 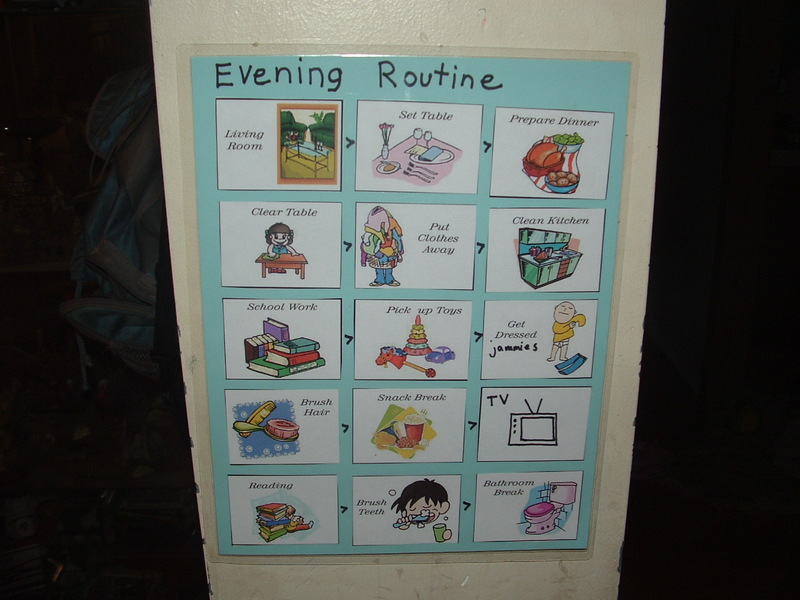 But with our new evening routine, I get it done everyday, because it’s on “The Chart,” as we have begun calling it. We learned about the blood vessels in the hand when Gramma cut her thumb on a can. We made cards for Grandpa when a dear friend of his passed away this week unexpectedly. This was a week of ups and downs, learning and growing. Torah remains our guiding beacon, the light at our feet. It shows us the way, whether we are dancing or rocking with a book. I hope you had a productive week of teaching your children when they rise up and when they lie down. This post is being shared with TOBY homeschool highlights. What a lovely week, Heidi =) I love the way you explained all the natural learning that took place this week at your house. Never a dull moment, eh? So glad it is prep day…. may yours be productive, and your Shabbat blessed =) Shalom and love! The same to you! Shabbat Shalom a little early. Beautiful! As it should be! You have such a way of descriptive writing! Would you be willing to share what kind of math games you use? I am always looking for some for my 1st grader. We like Number Drill, which we got from Timberdoodle. It involves sledding polar bears and penguins. I also made a math card game which you can download here.